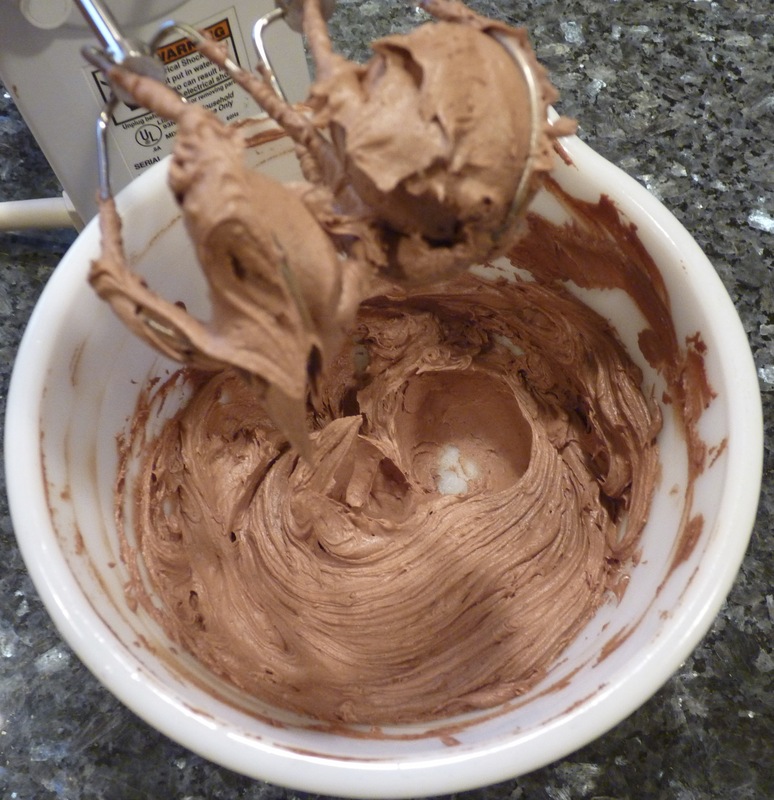 Frosting made with just butter and chocolate chips? Believe it! 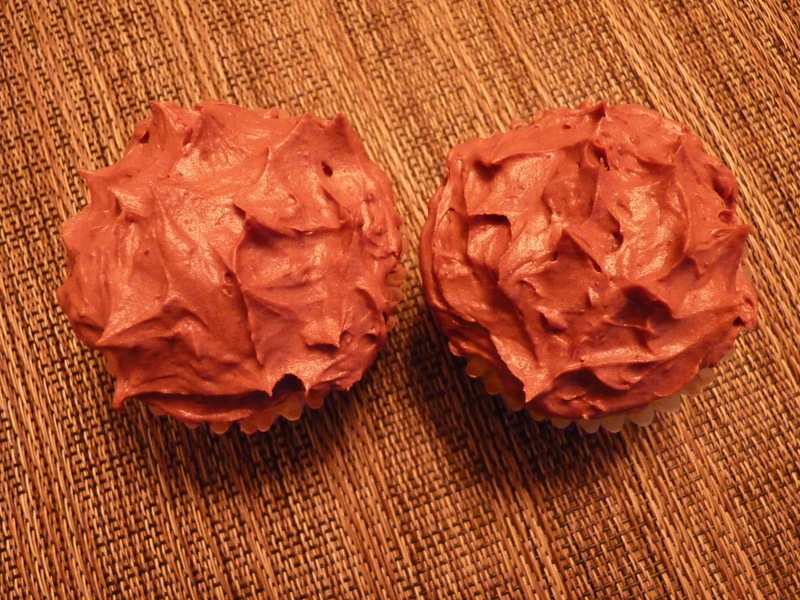 It looks like frosting, tastes like frosting, and is really easy to make. Heads up: You need to plan ahead a bit because the butter and chocolate chips are melted, cooled, and then brought back to room temperature before mixing into a fluffy, smooth frosting. But it’s worth the wait! You’ll find the recipe here on Cookies and Cups. I made a smaller amount, using 1/2 cup of butter and 1/2 cup of chocolate chips, which worked just fine. I really enjoyed trying to pronounce this French dessert. Sahvahrunh, savarnnnnh…just say it fast with a nasal ending and call it good. But you may not want to listen to me, because 10 out of 10 French people agree that my accent is no good. The dessert, however, was quite good. I thought this would be a lengthy project, but with quick rising times, it wasn’t too much trouble to make. 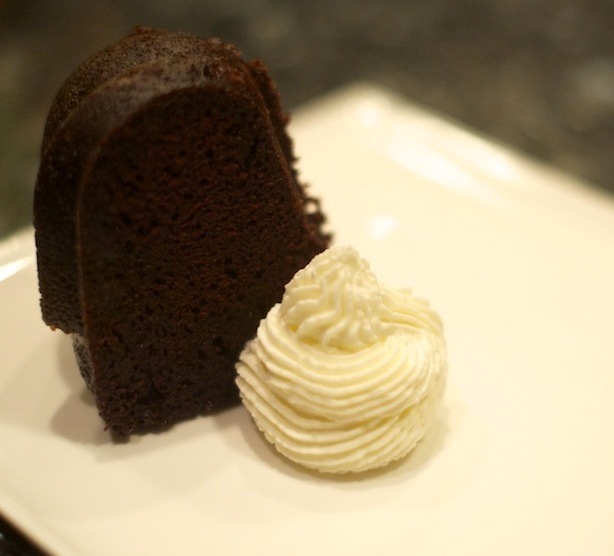 I made 1/2 recipe and, lacking a ring mold, baked it in a 6-cup bundt pan. The verdict? Delicious! The cake was light as air, even after being soaked in the sugar syrup. I loved the combination of the orange Grand Marnier with the strawberries. This would be an impressive, not-too-heavy dessert to serve to company. This recipe, baked by the Tuesdays with Dorie group this week, is on page 416 of Baking with Julia. You can also watch a video from the show here, and you can see the recipe here. 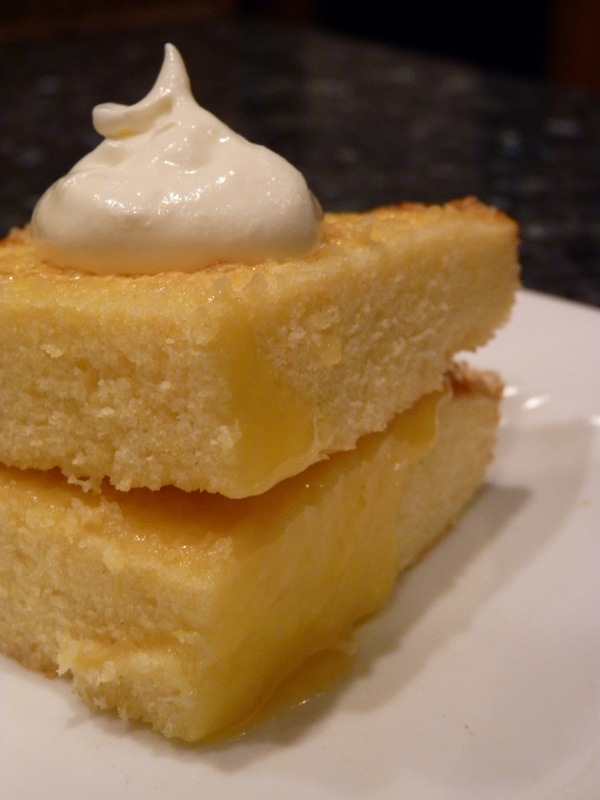 The second recipe of the month for the Tuesdays with Dorie group is Lemon Loaf Cake. Lemon desserts always look so good, but I don’t often bake them, so this recipe was a welcome selection. 6″ pans, what would I do without you? I made 1/4 of the recipe, and though a 6″ round pan wasn’t exactly the right size, it was close…or at least I thought it was. When I took the cake out of the oven, I was concerned that it looked awfully low and flat. So concerned that I decided to make some lemon curd to serve with it, just in case it needed a little bit of help. When I cut into the cake, I was happy to see that it had the texture of a pound cake, so I was pretty sure it turned out like it was supposed to. But I’m glad I made the lemon curd because it was delicious! 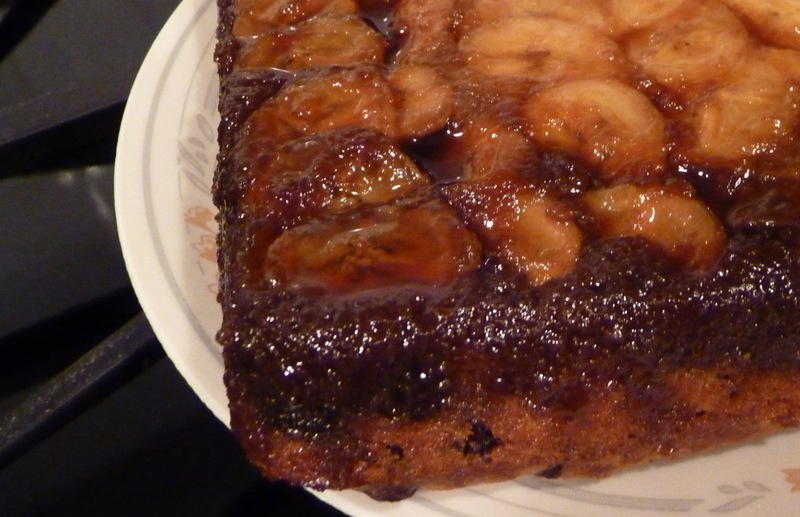 I used this recipe from Cooking Light – it was easy and definitely something I’ll make again. I’m already looking forward to stirring the leftovers into some yogurt. After I assembled the cake and lemon curd, I realized that I should have tasted the cake on its own first. So I didn’t get a taste of “just cake,” but I really enjoyed it combined with the lemon curd. 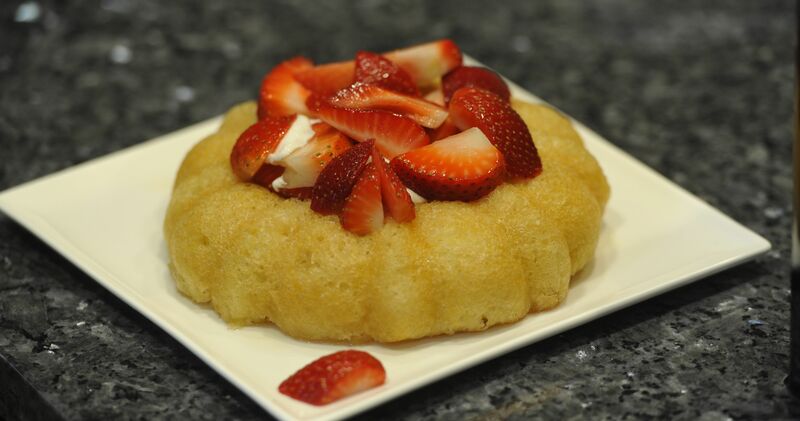 My husband enjoyed it and said that it was like pound cake, but “not boring.” Note to self: don’t make plain pound cake because he will declare it boring! Side note: yes, I made 1/4 of the recipe. When I first started baking with the Tuesdays with Dorie group, I thought it was strange the people were making 1/2, 1/3, 1/4 of a recipe. Now I think it’s a great idea. There are only two of us eating much of what I bake (though I do give things away when I can), so we don’t need a ton, and if I bake smaller amounts I can bake more often and we can have more variety. Plus, it keeps my math skills sharp! Ready to get your lemon on? You can find the recipe on page 252 of Baking with Julia. Thank you to this week’s hosts: Truc of Treats and Michelle of The Beauty of Life. They will have the recipe posted on their blogs today. Happy Valentine’s Day! 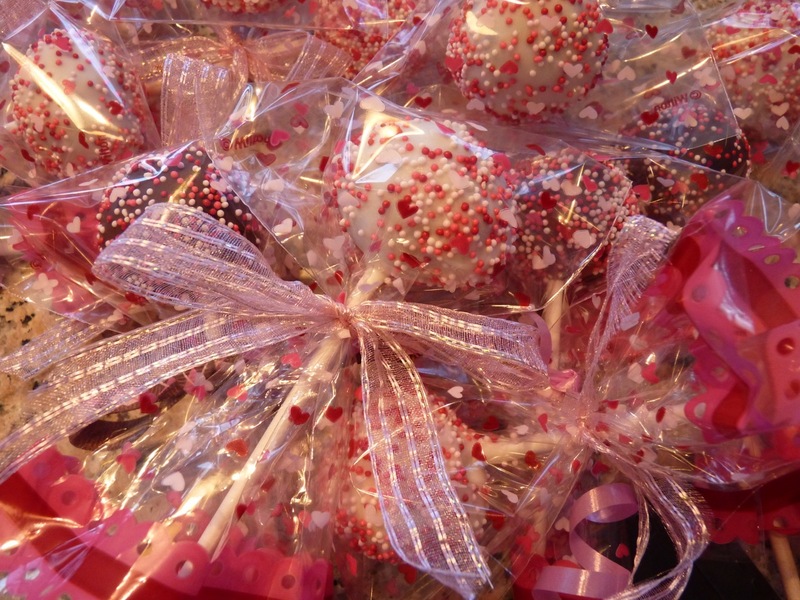 It’s a holiday all about sweethearts and sweets, so to celebrate, my friend L and I got together over the weekend and made cake pops. 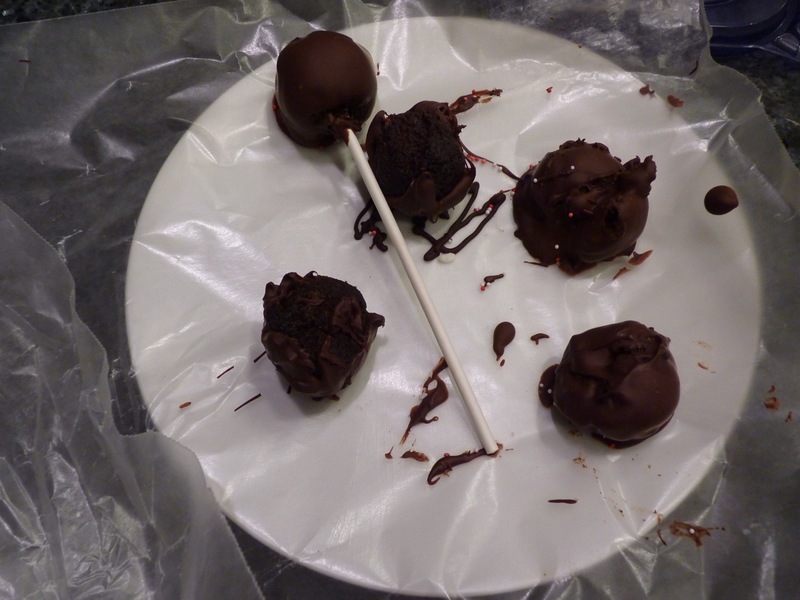 It was the first time either of us had made them, and boy is my arm sore…from patting myself on the back! We were pretty excited about the results. 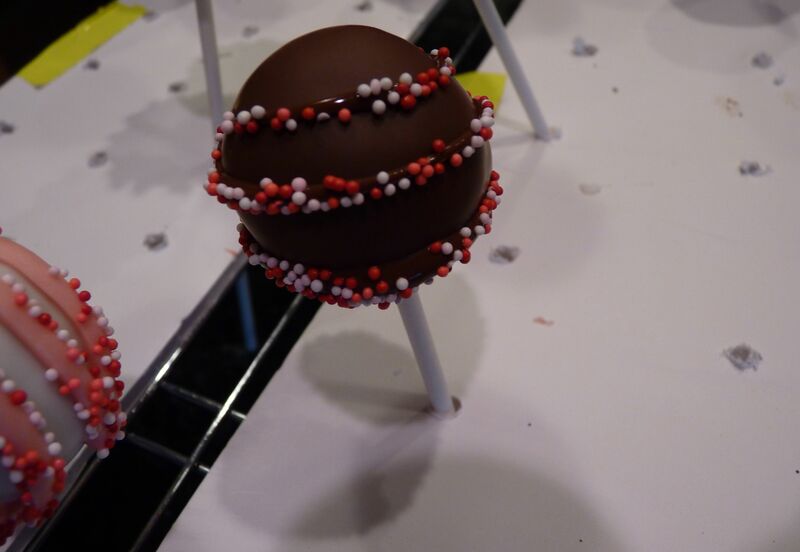 I knew we better not try any over-the-top designs, so we stuck with basic white- and chocolate-dipped cake balls topped with sprinkles. 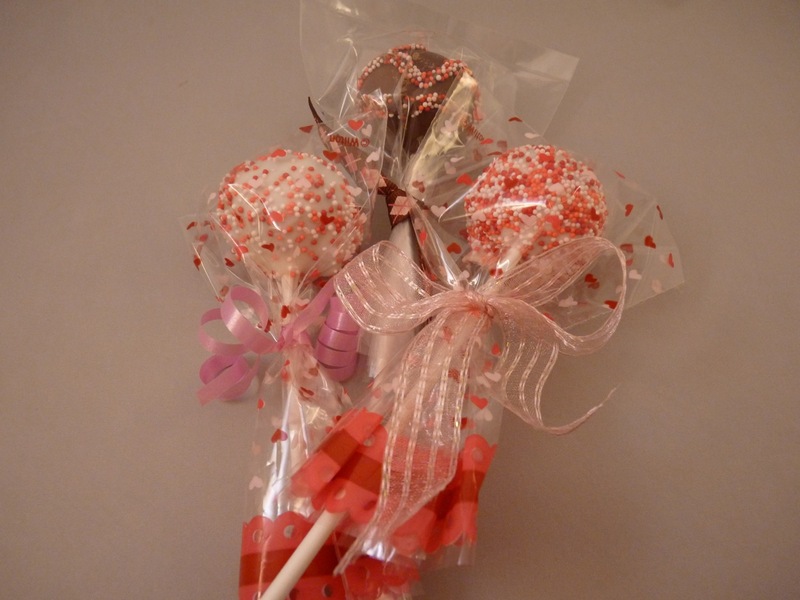 L brought some really cute Valentine lollipop bags and ribbon, and believe me when I say that even a less-than-perfect cake pop looks great packaged in a cute bag tied with ribbon. I was shocked to learn that we didn’t have any styrofoam in the house. My handy husband came through by drilling holes in some foam core and taping it on a cooling rack. It worked well, but next time, I’ll make sure we have styrofoam. Of course, there were some flops. Perfect for snacking though! 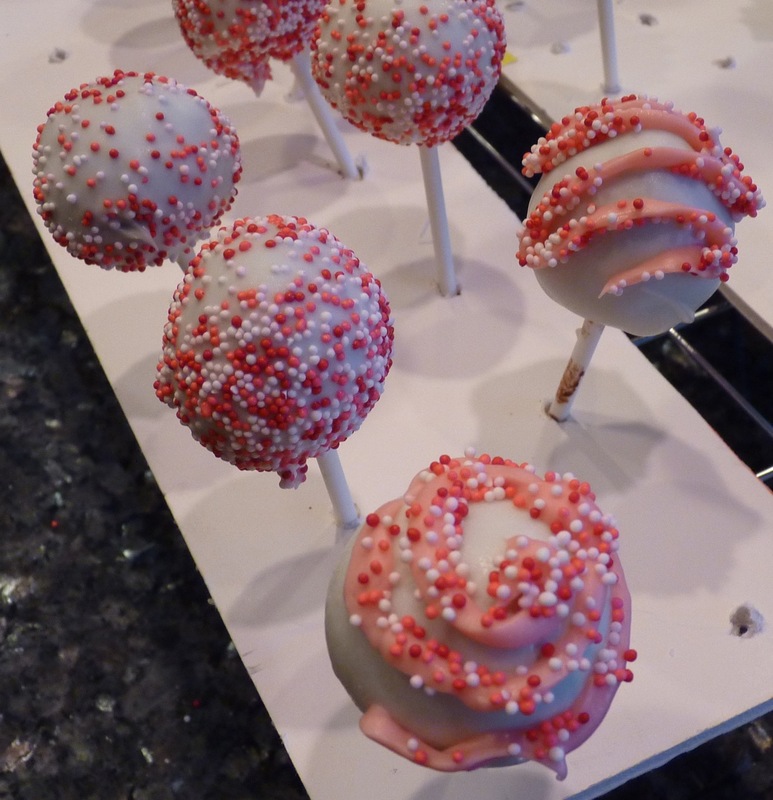 If you aren’t up to speed on cake pops, this video from Bakerella, the inventor of cake pops, will catch you up. Many of my baked goods go to our next-door neighbor Chuck. A while ago, I asked him if he had any requests and he said I should make something with dates, because that’s the only date he’s going to get. Chuck is a funny guy! 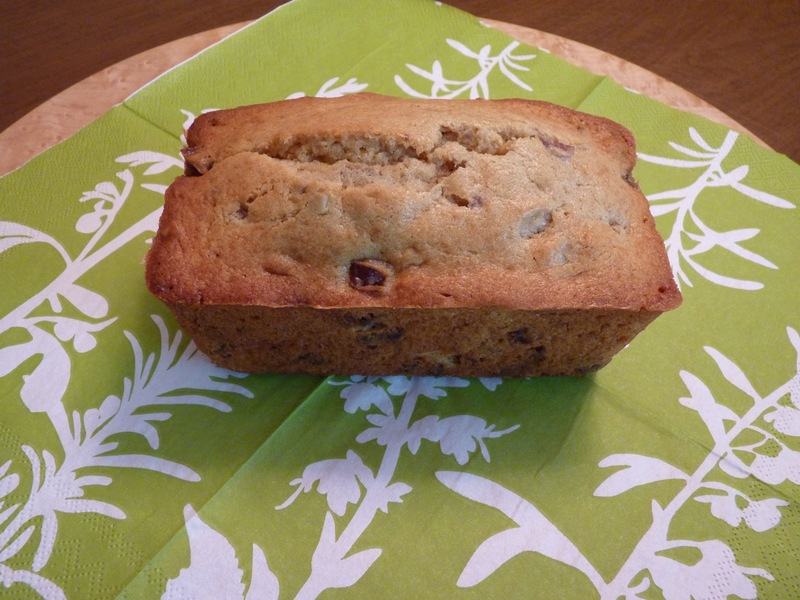 So it was perfect timing that Mary selected Date-Nut Loaf for this week’s Tuesdays with Dorie recipe. Dates and I go way back. When I was growing up, we frequently had a Date Nut quick bread from a mix. I hadn’t thought about that for quite a while and wondered if they still made the mix, but I didn’t find it at the grocery store. My mom also made a date and chocolate chip cake, which I think I’m going to make now that dates are on my mind. Apparently, Chuck has been thinking about dates too, but he’s going to have to settle for a mini Date-Nut loaf for now. What I did: I made the full recipe and baked it in three mini-loaf pans (5.75 x 3 inches each). I didn’t make any changes to the recipe! How it went: This was quick and easy to mix up. I never remember to keep track of how long things were in the oven, but I think my minis took about 40 minutes (baking time for a full-sized loaf is 1 hour 20 minutes). I did not need to tent them in foil to keep them from getting too brown. How it tasted: This is a solid buttery cake with crunchy walnuts and moist dates. It’s tasty – I especially like the buttery taste of the cake. Since I have a memory of a quick bread with dates, I kept thinking this would be like that, but really, it’s more like a pound cake. Once I figured out what it was, I enjoyed it! My husband said it was good but he’d prefer it without the dates. When pressed, he admitted that he’d prefer it without the nuts too. With no dates or nuts, we would be left with just plain Loaf. Thank you Mary for the date-paved trip down memory lane! She has the recipe posted here. Or just open your copy of Baking: From My Home to Yours to page 228 and get baking! You are currently browsing the archives for the Cake and Frosting category.